Parsley is a popular culinary and medicinal herb recognized as one of the functional food for its unique antioxidants, and disease preventing properties. This small leafy herb is native to the Mediterranean region. It is a biennial plant belonging to the Apiaceae family, of the genus; Petroselinum. Its botanical name is Petroselinum crispum. The herb is a small plant featuring dark-green leaves that resemble coriander leaves, especially in the case of flat-leaf parsley. However, its leaves are larger by size and milder in flavor than that of leaf-coriander. The herb is widely employed in Mediterranean, East European, and American cuisine. There exist several cultivars of parsley growing across the Europe. Italian or flat leaf parsley (Petroselinum crispum neapolitanum) is well-known around Mediterranean countries and has rather more intense flavor than curly leaf parsley. Mitsuba (Cryptotaenia japonica) is a garnish herb used in Japan and China as an alternative to parsley. It has similar flavor and appearance to that of European flat-leaf parsley. Parsley is one of low calorific herb. 100 g of fresh leaves carry just 36 calories. Additionally, its leaves hold zero cholesterol and fat, but rich in antioxidants, vitamins, minerals, and dietary fiber. On the whole, the herb helps in controlling blood cholesterol and may offer protection against free radical-mediated injury and cancers. Parsley contains health benefiting essential volatile oils that include myristicin, limonene, eugenol, and α-thujene. The essential oil, Eugenol, present in this herb has been in therapeutic application in dentistry as a local anesthetic and antiseptic agent for teeth and gum diseases. Eugenol has also been found to reduce blood sugar levels in diabetics; however, further detailed studies required to establish its role. Parsley is rich in polyphenolic flavonoid antioxidants, including apiin, apigenin, crisoeriol, and luteolin; and has been rated as one of the plant sources with quality antioxidant activities. Total ORAC value, which measures the antioxidant strength of 100 g of fresh, raw parsley, is 1301 µmol TE (Trolox equivalents). The herb is a good source of minerals like potassium, calcium, manganese, iron, and magnesium. 100 g fresh herb provides 554 mg or 12% of daily required levels of potassium. Potassium is the chief component of cell and body fluids that helps control heart rate and blood pressure by countering pressing effects of sodium. Iron is essential for the production of heme, which is a critical oxygen-carrying component inside the red blood cells. The human body uses manganese as co-factor for the antioxidant enzyme, superoxide dismutase. Additionally, the herb is also rich in many antioxidant vitamins, including vitamin-A, β-carotene, vitamin-C, vitamin-E, zeaxanthin, lutein, and cryptoxanthin. The herb is an excellent source of vitamin-K and folates. Zeaxanthin helps prevent age-related macular degeneration (ARMD) in the retina (eye) in the elderly population through its antioxidant and ultraviolet light filtering functions. It is, perhaps, the richest herbal source of vitamin-K; provide 1640 µg or 1366% of recommended daily intake. Vitamin K has been found to have the potential role in bone health by promoting osteoblastic activity in the bones. It also has an established role in the treatment of Alzheimer's disease patients by limiting neuronal damage in their brain. Parsley (Petroselinum crispum), Fresh, Nutrient value per 100 g.
Fresh as well as dried parsley can be available in the markets all round the year. Attempt to buy fresh leaves over the dried form of the herb since it is superior in flavor and rich in many vital vitamins and antioxidants. The herb should feature vibrant green leaves, and firm stalks. They should be free from mold, dark spots or yellowing. Just like with other dried herbs, when purchasing dried parsley, try to buy one that has been organically grown since this will give you some sense of assurance that it has not been irradiated and free from pesticide residues. Fresh parsley should be stored in the refrigerator packed in a zip pouchor wrapped in a slightly dampened paper towel. Dried leaves can keep well for few months when stored in a tightly sealed glass container and placed in cold, dark and dry place. Its leaves, stalks, and roots of this herb plant have antiseptic and carminative properties. Eugenol also has beenfound to reduce blood sugar levels in diabetics; however, further detailed studies required to establish its role. An extraction from the herb has been found to have diuretic effects. Parsley should be washed thoroughly in the water in order to remove sand and dirt and to rid off any residual pesticides. Trim the roots, thick part of stems, and any bruised or old leaves. In order to keep the fragrance and aromatic flavor intact, it is generally added at the end of the recipes. Delicious zucchini bite with parsley as a garnish. Photo: norwichnuts Mediterranean green sauce-salsa verde. The herb is widely used as a garnish. Many dishes served with fresh green chopped parsley sprinkled on top. It has been used in the preparation of many popular dishes in Mediterranean and Europeancuisine since ancient times. Along with other herbs and spices, it is being used as flavoring agent in the preparation of vegetable, chicken, fish and meat dishes. It is one of the common ingredients in the famous Mediterranean green sauce, "salsa verde," a cold sauce made of parsley, capers, garlic, onion, anchovies, olive oil, and vinegar. Freshly chopped parsley is a great addition to a green salad. 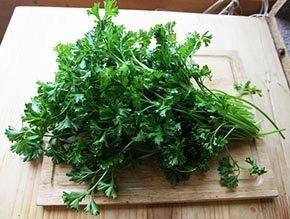 Freshy and dry parsley leaves can be used in the preparation of chutney, dips, pesto, etc. Parsley should not be consumed in large amounts or as a drug or supplement by pregnant women. The essential oil in its root, leaf or seed could lead to uterine stimulation, bleeding and preterm labor. This herbaceous plant is very high in oxalic acid, 1.70 mg per 100 g. Prolonged consumption of oxalate-rich foods may result in gouty arthritis, kidney stones, and mineral nutrient deficiencies. Parsley oil contains furanocoumarins and psoralens, which may lead to extreme photosensitivity if used orally. (Medical disclaimer). <<-Back to Herbs from Parsley. Visit here for an impressive list of all variety of herbs with complete illustrations of their nutrition facts and health benefits. Refer Stanford School of Medicine Cancer information Page-Nutrition to Reduce Cancer Risk (Opens in New Window). Pub med: Parsley (Opens new window). © copyright 2009-19 @ www.nutrition-and-you.com. Find us on Google+. All rights reserved.